CHANCES ARE YOU remember Boston Dynamics, the robotics company Google acquired back in December, and the collection of animalistic robots it has developed. 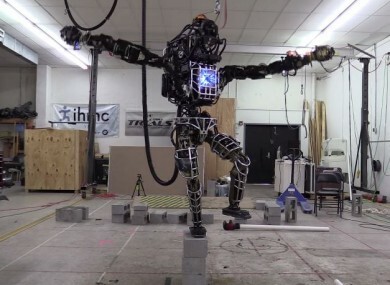 For those of you who haven’t been keeping up with its work, it has also been working on another humanoid robot called Atlas, and for its latest demo, it reenacted the crane kick scene from the 1984 movie, The Karate Kid, while balancing on three cinderblocks. The 6.2 robot weighs more than 300lbs (21.4 stone) and while it doesn’t move flawlessly – it wobbles around a little bit when lowering its arms – it’s still able to keep its balance. The robot was programmed by IHMC Robotics, which uses the Atlas robot for its DARPA Robotics Challenge (a competition aimed at improving ground robotics capabilities when dealing with disaster response situations). Altas was designed to mimic the human body and help with a range of search and rescue tasks. It’s also able to navigate rough terrain. Unfortunately, no robots representing the Cobra Kai dojo were included in this demo. Email “This Google-owned robot reenacts crane kick scene from Karate Kid”. Feedback on “This Google-owned robot reenacts crane kick scene from Karate Kid”.